To say it is cold here is a major understatement. It's freeeeezing. To give you some perspective, the other day the high was 30 something and I found myself thinking "huh, it feels kind of nice out". 30s compared to the teens we've been having is like a summer day. 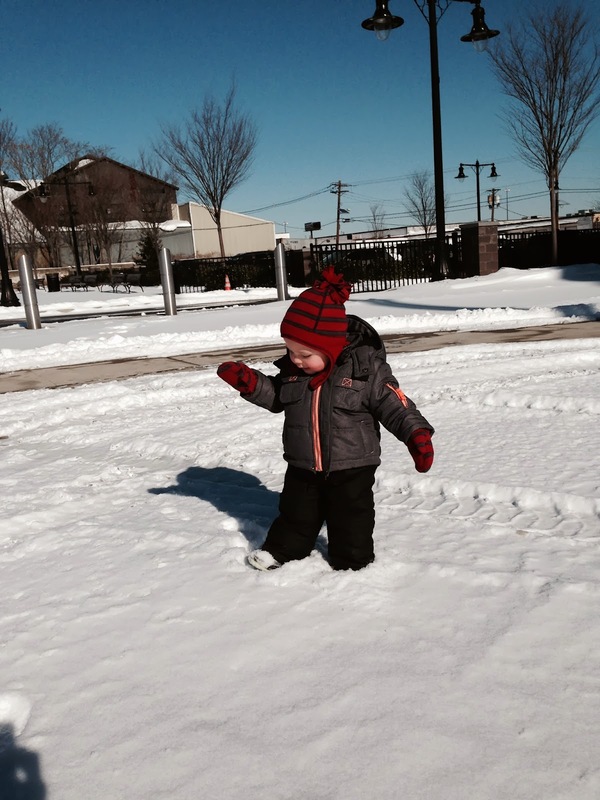 The chilly temps are test a mom's creativity of things to do with little munchkins. 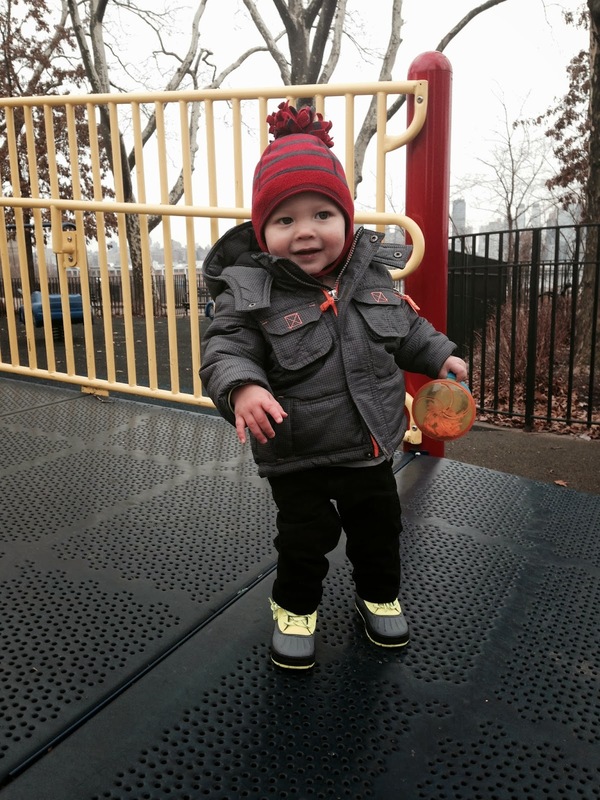 Before the snow hit, we managed to get out for a walk and a trip to the playground. Albeit a very short trip as it was still really cold! Once the snow rolled in though we haven't been as eager to get out. We had to let him play in the snow at least once since he's never seen snow before. 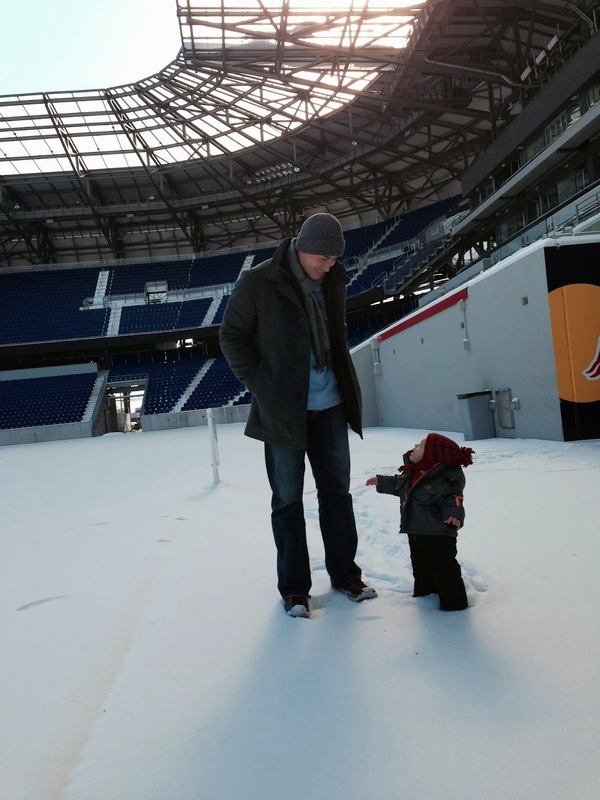 Plus I think babies in snow gear has to be one of the cutest things ever. All that puff surrounding his chubby face just melts this mama!! 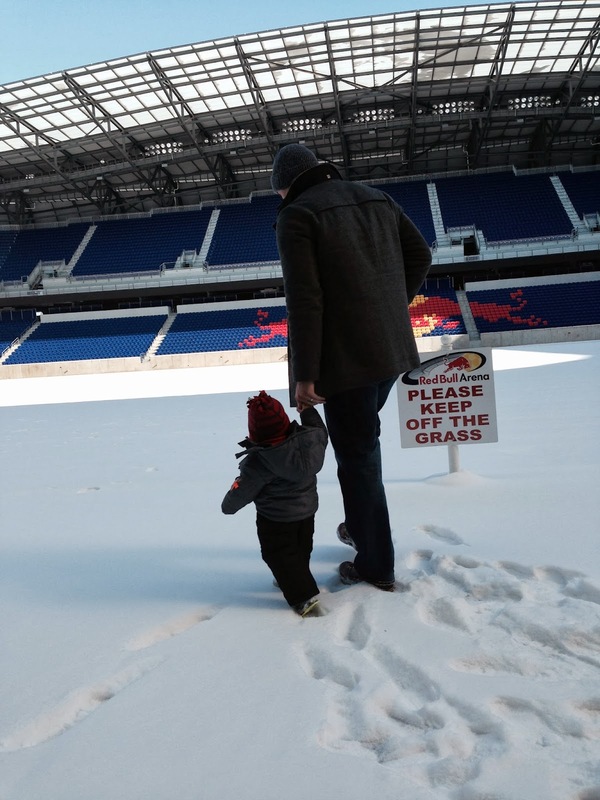 Luis had a meeting one day so we tagged along in hopes that he could play in the fresh powder on the field. He wasn't too thrilled about the idea though and it wasn't long before he was raising his arms to be picked up. We also braved the playground one day in order to kill time before we were supposed to meet a friend for lunch in the city. 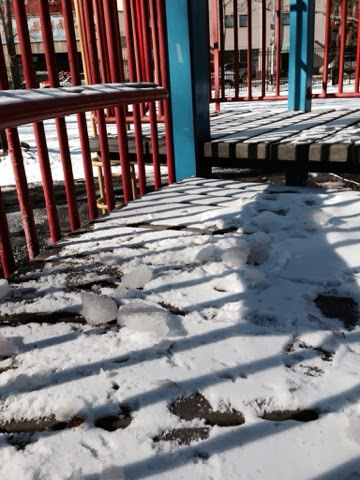 That got real interesting though when we realized there were icey patches and the slide was crazy fast. Eli had no awareness of any of this of course and ran full steam ahead as I chased behind him steering him away from the ice, helped him up the stairs, then hurried around to grab his hand to help him down the slide so that he wouldn't slip and fall his way down. 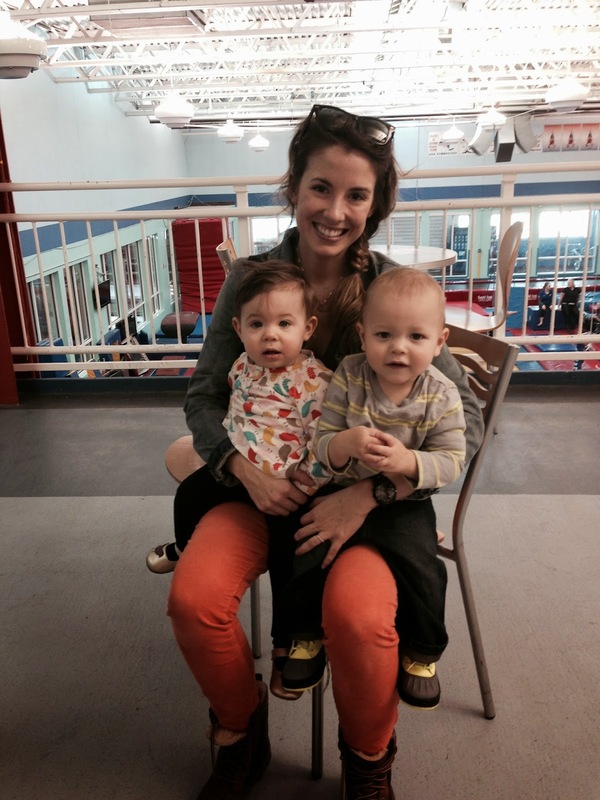 Needless to say, I have been racking my brain for indoor activities that are both budget and baby friendly. My friend Jenelle and I try to get together every so often. She has a daughter, Evelyn, who is a little younger than Eli and just as adorable. Our default activity is usually the mall because it's free, warm and there's a play area and lots of space to run around. Of course, being at the mall means we go in the stores and unfortunately, the stuff they sell there isn't free which means our "free" outing usually ends up costing us something. Trying to avoid the mall scene, I went on a search for indoor play areas in the city and surrounding areas. 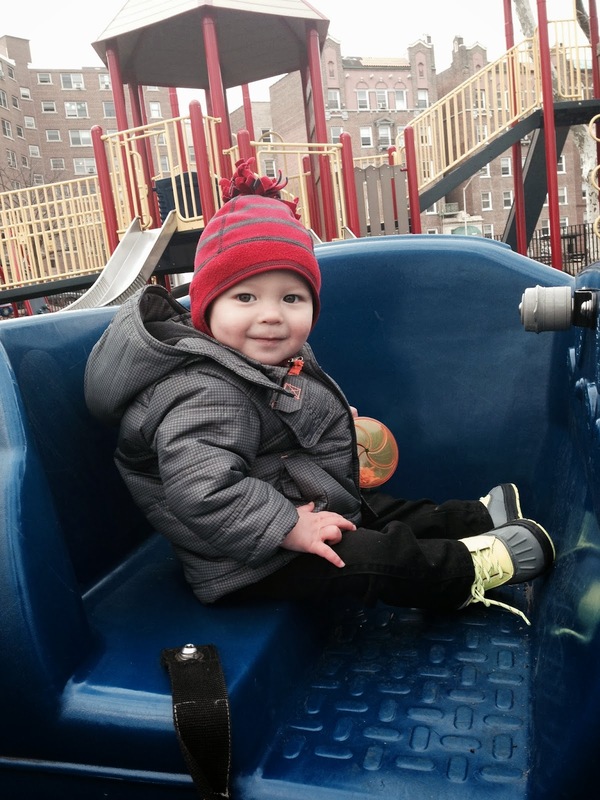 We narrowed it down to the Brooklyn's Children's Museum, City Treehouse and Chelsea Piers Toddler Adventure Center. The museum was our first choice but it's such a trek over to Brooklyn that we thought it best to wait for more desirable weather. City Treehouse looked awesome but at $10 per HOUR for your first time visit (and $20 an hour thereafter) it suddenly didn't look so awesome. Chelsea Piers is only $12 per session (morning or afternoon). Sold! I didn't get any actual pics of the play area. It definitely was smaller than I expected but it was perfect for these two cuties. For older kids, they have a lot of great options including organized sports, gymnastics and so much more--all indoors. 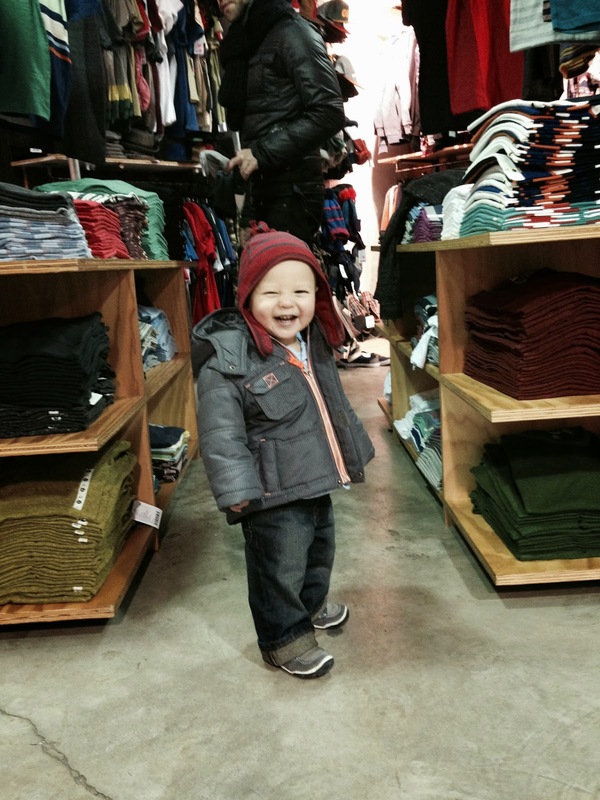 Of course, in a pinch, Urban Outfitters can be a great spot to let little people run around when they get too noisy at a restaurant and you need to make a quick escape but it's too cold to run around outside. We wouldn't know anything about that of course. Our child is always perfectly behaved at restaurants...ha!